Bought up in the backwoods of British Columbia Tom learned his comedy stripes in Canada, where he recorded his own one-hour TV special Stade And Confused for the Comedy Network. Now known in many households as a regular performer on the John Bishop show, Dave’s One Night Stand and Live at The Apollo. In 2013 Jenny started writing and performing the live comedy, winning the Best Newcomer Award in the 2013 Musical Comedy Awards after just 3 gigs. This led to an hour on the free fringe with the brilliantly talented Jessie Cave, performances for BBCR1 and BBCR4 and playing at Glastonbury. In 2014 Jenny was commissioned to make her own pilot by BBC Comedy and was named The Observer & Guardian’s Rising Star of Comedy for 2015. Jarred has a unique style that deftly mixes gags with storytelling. He has a dynamic onstage persona and the ability to improvise and roll with anything that’s thrown his way. 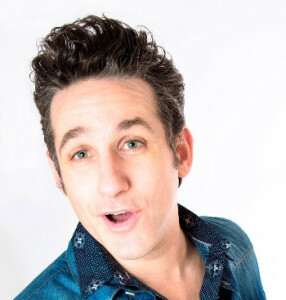 His energetic storytelling has earned him a whole host of accolades including a Chortle Award and has catapulted him to the forefront of our TV screens in shows such as Mock The Week (BBC2), Never Mind the Buzzcocks (BBC2) 8 out of 10 Cats, (Channel 4), Argumental (Dave), One Night Stand (Dave) and Let’s Dance for Comic Relief (BBC 1). If you’re thinking that Tom looks familiar, you may recognise him as 1/5th of comedy super group The Noise Next Door who have been smashing the comedy circuit for years. With his cheeky charm and musical madness, he has been leaving comedy clubs up and down the country in stitches. He has also been seen on BBC1, BBC2, ITV and heard on radio. John first caught the stand up bug after a visit to a comedy club in Dublin and quickly discovered that making a clown out of himself wasn’t all that bad.He made his long awaited debut at the Edinburgh Fringe Festival in 2011 with his first solo show Social Networking. In 2012 and 2013 he was invited to join Tom Stade as a special guest on his nationwide UK tours playing to packed houses.